At ISD, parents are partners in their children’s education. Next week’s parent teacher conferences are an essential part of this partnership. I would like to offer the following six tips for parents to get the most out of the parent-teacher conferences. Parent teacher conferences are a great way to learn more about your child’s progress and how you can help them at home. We understand some of our parents’ work and travel schedules may prevent them from attending. If this is the case, do not hesitate to contact the teachers to arrange another day to meet. Is my child working up to his or her ability? Where could s/he improve? What can we do at home to support what you are doing in the classroom? Ask the teacher how s/he is helping your child address this area and try to identify ways you can support your child at home. A child may appear to be fine in the classroom, but sharing concerns at home. The child may be unhappy or worried about something or someone in the classroom and not be telling the teacher. Share this information so the teacher can address the issue. If you would prefer to speak in your native language, feel free to bring a friend who can translate between your language and English. Everyone likes to hear positive news. If you child is happy with the teacher or a particular activity in the classroom, let the teacher know. To accommodate all parents, parent-teacher conferences are meant to be short meetings. If you need more time, please arrange to meet with a teacher to continue the conversation on another day. Thursday, October 26 and Friday, October 27 in the afternoons. Elementary school conferences are by appointment. Your child will bring home your scheduling information in hard copy. For any questions, please contact Emefa Atiase at emefaa@faculty.isd.sn. Secondary school conferences are not scheduled. Parents are invited to meet with the teachers at their convenience during the scheduled times. Given the number of parents, there may be a line of parents waiting to see a particular teacher. ISD is starting the third year of our strategic plan. The strategic plan outlined six major goals for the school to accomplish over a five to seven year period. This article will outline the progress we have made and the specific plans we have for this year. The counselors, administrators and teachers have been working on this goal for the past two years and implemented a number of program and policy changes. Parent and student surveys from the end of last year indicate that progress has been made, but there is still room for improvement. These improvements will continue to be refined under the leadership of our new Secondary School Principal, Mr. Bird. At the end of the 2015-2016 school year, the board approved the construction of a new performing arts center and athletic complex. The arts center would include a 350-seat theater, black box theater, and art gallery. The athletic complex will have an air-conditioned double gym, fitness room, classroom, and dance studio. Last year, working with Flansburgh Architects from the United States, as well as local architects, the two construction plans for the two buildings were developed. In addition, the school selected a local project management firm to oversee the construction. One of my goals this year is to finalize the design phase of the construction project and begin construction. We anticipate finalizing the construction plans in early October and starting the contractor bidding process by mid-October. The first part of construction will start in December or January. The current construction timeline is 20 months. This strategic goal had three parts to it. One, increase the number of students acquiring the International Baccalaureate Diploma, which serves students in grades 11 and 12.. Two, examine the feasibility of adding the Primary Years Program for students in the elementary school. Three, examine the feasibility of adding the the Middle Years Program for grades six through ten. A number of improvements were made to the IB Diploma Program in 16-17, which lead to an increase in the nubmer of students earning the IB Diploma, as well as the overall pass rate. Another one of my goals this year is to work with Mr. Bird, and our new IB Diploma Coordinator, Mr. Lennon, to increase the number of students who pursue the full diploma and help the students improve their performance on the exams. To accomplish this, we will continue to provide training for our teachers, examine the overall workload of the IB teachers to give them more time to focus on their IB courses, and explore bringing in course review specialists in the spring to provide additional review for our students before the exams. 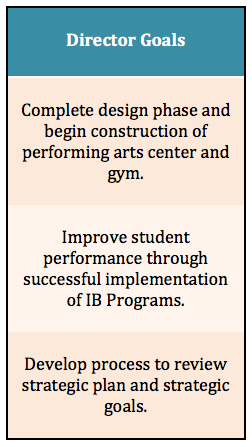 Last year, the board approved ISD becoming a candidate school for the IB Primary Years Program. Under the direction of Brad Chumrau, acting ES Principal and PYP Coordinator, the teachers have begun developing and implementing new instructional units of study. One of my goals is to ensure Brad and the teachers have the training and resources they need to successfully implement this exciting program. A teacher committee reviewed the Middle Years Program last year and made a series of recommendations for this year including continuing to learn more about the classroom implications of becoming a MYP school. Mr. Bird and the teachers have continued to learn more about the program and will be presenting the information to the Board starting in October. Given the scale of our strategic goals, we needed to prioritize them to make sure we had sufficient resources to move forward. Work on ths goal has been scheduled for next year. This goal is an extension of goal number five. It will be largely addressed through changes to our Service Learning program to meet the requirements of the IB Programs, which ask students to identify areas of need and design projects that will help others in Senegal. We want our students to have more direct connections with people rather than simply raising money on campus. We have made significant progress towards our strategic goals over the past two years. As we approach the mid-point of the plan, it is time to assess our progress as well as examine the effectiveness of the strategic plan in general. My last goal for the year will be to work with the Board Policy Committee to assess the strategic plan and the goals to determine if we need to make any revisions to the overall plan on the goals. We will present the results of our assessment at the Annual General Meeting in April. Getting children up and ready in the morning can be difficult. Personally, my wife and I have survived the struggles of getting teenagers out of bed when they just want “ten more minutes.” Dakar traffic can make the task of getting to school on time even more difficult. However, it is important for students to arrive on campus early enough so they can be in the classroom for the start of lessons. Educators know the first ten minutes of a class or a lesson are critical for effective learning. Teachers use this time to settle the students for the class period, pose questions to stimulate the students’ thinking, and provide critical information needed for new learning. Students who arrive late to class not only miss information they need to complete their assignments, but can also disrupt the learning of other students. ISD Students should arrive on campus by 8:20am so they have enough time to order lunch if they want and get to their classroom on time. Secondary school students who arrive late to campus are considered tardy and excessive tardies will result in disciplinary consequences. The administration will contact parents of elementary students who are consistently late as well. This will unfortunately be more difficult after the Tabaski holiday for families coming from Almadies. By then, the Ecole Actuelle Bilangue (EAB) will have started. Since EAB is on the route from Almadies to ISD, there will be traffic jams starting around 7:30am. Families coming from Almadies should add 15 to 20 minutes to their driving time if you usually pass EAB between 8:00am and 8:15am. Last year, we asked the EAB administration to enlist the help of a gendarme to help with traffic, which they did, and it reduced travel time. To help families calibrate their morning schedules, students are allowed to arrive on ISD’s campus starting at 7:30am. Elementary students will be supervised by our teaching assistants and are welcome to go to the library or play on the playground or fields. Older students are welcome to study in the library or the outside tables. We want the ISD campus to be welcoming both before and after school, especially since a smooth start to the day is important for everyone in the family. Please help make sure our students are leaving early enough to arrive at school on time, even factoring in the increased traffic. ISD faculty greet students as they arrive in the morning. What makes ISD unique in Dakar? What makes ISD unique in Dakar? In educational language, our goal is provide a holistic educational program. In layman’s terms this means that while academics are important, it is not our sole focus. We also develop the student’s artistic, athletic, social, and emotional skills. We believe that students need to have strong skills in all these areas in order to be successful and happy in their future schools and later in life. How do we do this? In elementary school, students take art and music a couple of times a week, taught by specialists in these areas. As they move into the secondary school, students can also take drama courses. Recently, we added video production and film to the secondary school. These arts courses develop the students’ creativity, help them build confidence through performances, and help them discover new talents. The research is clear that students who are physically active do better academically, are able pay attention longer, and work harder to maintain their grades so they are able to remain eligible to play sports. Additionally, being a part of team teaches life skills of leadership, collaboration, and perseverance. We make a point to incorporate athletics into our school, developing students’ skills through regular physical education classes starting in Pre-K 3. This is a required course from all students through grade ten. The students further develop their skills, while gaining the benefit of being physically fit, through after-school activities and sports. The elementary after-school program includes soccer, basketball, and martial arts. Volleyball, basketball, and soccer are the major sports in the middle and elementary school, with both local and international competitions. The swimming and track teams are open to students in all three schools. If a student is unhappy, having difficulty with friends, experiencing stress in their lives, or struggling with the adjustment to a new city and school, they will not do their best at school. It is normal for all students to deal with the issues at some time in their lives, particularly students who move frequently and live apart from the support of their extended family, as many of ours do. To help students learn how to handle these emotions and transitions, ISD provides professional guidance counselors who help look after our students’ social and emotional well-being. The counselors serve our community through regular classes, working with small groups, meeting individual students, as well as individual conversations with parents and workshops for parents on child development and parenting. They are a resource to the teachers and administrators, helping us better meet the individual needs of our students. In addition to all of the above, the secondary school counselor guides 12th grade students through the challenging and often confusing process of applying to colleges in the US, Canada, UK, France, Belgium, and Asia. Taking care of the student’s social/emotional needs and supporting our parents are high priorities at ISD! The best schools in the world have strong arts and sports programs. They care for their students and help them develop the social and emotional skills they need to form strong relationships and navigate through difficult times in their lives. Yes, academics are important at ISD! But our students also need the artistic, physical, social and emotional skills they will gain by being an ISD student, where we strive to educate the whole person. Yesterday, all parents were sent an email with a link to a survey about our French language program. Parents are invited to take the survey for each of their children at ISD. Yesterday, the program only allowed you to take the survey once, but we made an adjustment and you can now take the survey multiple times. As part of our review of the French language program at ISD, we would like to ask parents to take a short survey to give us more information about the strengths and areas in need of strengthening in the French program. Through the Annual Parent Survey, parents have indicated they would like to see improvement in this program. This new survey was designed by the administration and French teachers to identify what specific parts of the program are in most need of improvement. The survey is available in English and French. The results will be shared with the teachers and Board of Trustees. Click hereto take the survey. It will close on Sunday, June 4. Hier, les parents ont reçu un e-mail avec un lien les conduisant au sondage axé sur notre programme de Français. Ils sont invités à remplir le sondage pour chacun de leurs enfants à ISD. Hier, le logiciel n’autorisait pas de remplir le sondage qu'une seule fois, en conséquent nous avons effectué quelques réglages. Ce qui fait que désormais vous pouvez répondre plusieurs fois à l'enquête. Dans le cadre de la révision de notre programme de Français, nous souhaiterions demander aux parents de remplir un petit sondage pour nous donner plus d'informations sur les points forts et les domaines a renforcer dans le programme de français. A travers le sondage annuel, soumis chaque année aux parents, nous avons senti leur volonté de voir une amélioration dans le programme de français. Ce nouveau sondage a donc été conçu par l'administration et les professeurs de français afin d’identifier spécifiquement les composants du programme qui ont le plus besoin d'être améliorés. Le sondage est disponible en anglais et en français. Les résultats seront partagés avec les enseignants et le Conseil d'Administration. Cliquez ici pour remplir le sondage qui sera clôturé le dimanche 4 juin.